There’s a reason more people don’t quote projects using Value-Based Pricing: it’s hard. It’s really, really hard. Value doesn’t exist in a vacuum. There are a lot of factors to consider. There’s your time, project costs, duration of the project, value relative to market averages, project risk, expected time to realize value… in total, we cover 9 factors that affect a value-based price. This is complicated stuff. Justin is helping me develop a tool for Value-Based Pricing to be included with our course at ValueBasedPricing.com that will help you with all of the percentages and the math. Of course, a tool by itself can’t do everything for you. That’s why in this final installment of our Value-Based Pricing series, we take you step by step through every factor that you need to understand. There was so much in this episode, that we went well beyond an hour and started pushing an hour and a half. I was about to cut it off because we’d been going for so long, but there were so many questions in the chat, I decided we would stick around and answer as many as we could. It ended up being 2 hours of solid gold. I know there are many of you who are not Community members and don’t get to listen to the live stream, so I thought you’d appreciate that we took extra time to answer nearly a dozen questions from people wondering how to do Value-Based Pricing and included this extra segment in this episode for free. What is your time worth to you? Maybe you think of that in weekly or annual terms, but whatever that is, you’re establishing a baseline hourly rate that is internal. You determine that rate. It’s not something you give to the client but you definitely want to establish it. You have various expenses—hardware, software, internet, electricity—whatever it takes to keep the lights on has to be baked in to your costs. What kind of profit will the client realize as a result of your work? The client is the one who determines this and you have to uncover it through asking the right questions. You have to ascertain the value but the client defines it. 04:48 In the chat room, Brookes asks, “How do you phrase questions on your questionnaire to get the best read on a client, before your initial discussions?” He’s not actually talking about the value-discovering questions, he’s talking about what questions to ask on your questionnaire as a way of filtering. 05:10 Justin: Some of the questions I like to ask are ones that reveal whether or not the client is looking for the cheapest way to accomplish a task or if they’re focused on the best way to maximize value through solving a problem they’re having. That can be a subtle distinction in some cases, while in other cases it can be a dramatic difference. You definitely want to go for the clients who are looking for value, not someone who is looking to have you perform a task for them. 07:30 All of these points apply to every project you price on value. It’s no small task to uncover this kind of value. 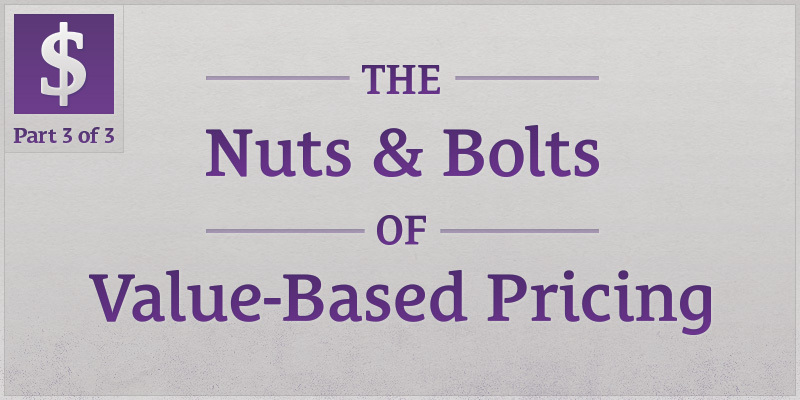 Justin and I are collaborating on a Value-Based Pricing course you’ll be able to get at ValueBasedPricing.com. In addition to the course material—training, videos, resources, etc.—we’re also building a tool that will be included along with it. You’ll be able to put these factors into the tool and it’s going to bring you closer to providing a price to the client. 08:19 Justin: I like to build tools and as I’ve been using Value-Based Pricing in practice, I built a tool to help me come up with a starting point for my value-based price I give to the client. I found the tool to be invaluable in my work because after I do all the discovering and information-gathering, I can plug in these factors in the tool and it will supply me with a value-based price. Now, it’s a tool so it doesn’t know every nuance of the situation but it gives me a starting point that I can tweak depending on human factors like intuition and instinct. It’s incredibly helpful to have a number to start with, instead of starting with a blank slate and trying to come up with a number out of thin air. The factors we’re going to talk about are the inputs for that tool and they’re the specific details of what the 3 Factors of Value-Based Pricing are comprised of. 09:31 Sean: The tool will help you with the complicated moving parts but it doesn’t completely do the job for you. We’re not saying you won’t have to understand Value-Based Pricing because you can just plug numbers into this tool and you’ll get a perfect price every time. The tool will only help get you closer. You need to take that final number with a grain of salt. 10:06 Justin: A tool only knows what you tell it and a tool is very rigid. Dealing with clients and having interactions at the level where you’re talking about serious things in depth, there’s nuance. There’s intangibles to it. One thing I found about the tool when I put the numbers in is I have a gut reaction to the number it spits out. If that gut reaction is, “Oh, that number is way to high,” or “Oh, that number is way too low,” the first thing I do is go back to examine what I input. It helps me sanity check what’s been going on up until that point. Maybe I realize my idea of what the costs are going to be are actually way off when I go back to reexamine. It helps me stay grounded in reality as far as logistics and being able to execute on this project vs. a shot-gun approach. 11:23 Sean: This tool will help you and make your job a lot easier but we don’t want to give it to you under the premise that you’ll only have to put numbers in and it’ll do the job for you. What we’re doing here today is breaking down all the factors because we want to help you understand all the reasons behind including these factors. That way, you’ll understand how it applies to Value-Based Pricing and you can tweak some of those numbers where they can and should be tweaked from project to project. 11:56 The first factor is internal hourly rate—the key word there being internal. This isn’t a number you share with the client, this is a baseline rate for your own internal purposes. The starting point I go with is what I need to cover my bills each month, then I divide that by 160 hours (40 hours/week). That total is a decent hourly rate for what you need to cover your bases. 12:42 Justin: That’s how I approach it. It should cover food, shelter, and lifestyle. This is your living wage—what you need as far as compensation for the time you put in to live the way you want to live. This should also be thought of as a baseline. When I say, “lifestyle,” don’t incorporate crazy trips every other week to Tahiti. This is to make sure your Netflix subscription is paid for and you can go out to eat every once in a while. It’s your basic hourly rate that will cover living. I can’t stress enough that this is an internal number. The client never sees or knows that hourly rate exists. This is to ensure your base costs are covered and you’re not going to hit the end of the month or end of the year and realize you’ve severely undercharged because you don’t have enough money to cover your costs. 13:58 The other key thing about the internal hourly rate is it doesn’t change based on what you’re doing or from project to project. People think of hourly rates as market hourly rates for certain tasks. This internal hourly rate isn’t task based, it’s to cover your food, shelter, and lifestyle. The temptation is to tweak the internal hourly rate based on the client, the project you’re doing, or the tasks you’re doing. This is purely the raw cost of your time. 14:48 Sean: In the chat room, Eric is asking, “Should your experience or skill level inform your base hourly rate?” Yes, it absolutely should. That is the raw cost of your time. Look at how people price based on an hourly rate: over time, as they get better, they increase that hourly rate. We would be doing the same thing here at a base level but that’s only the first piece to the puzzle. I believe your base costs should reflect your skill level. 15:24 Justin: If you’re a developer and you’re developing 90% of the time, you should look at general hourly rates for developers with your level of expertise as a starting point to determine this internal hourly rate. You want to make sure it covers your basic costs of living but you also want to make sure you’re not shorting yourself. It’s important that you take your skills and expertise into account because you worked hard to learn all of that to get this far. Don’t short change yourself by giving yourself a low internal hourly rate because you think it will get you more clients or will help you be more appealing to them. 16:16 Sean: We’re talking about starting from a place that covers your bills—that’s the minimum hourly rate you should consider. You shouldn’t even consider anything less than that. The minimum is covering your bills no matter where you’re at. If you’ve been doing this for a long time, you’re good at what you do, and your time is valuable in and of itself, then that internal hourly rate should be higher. When we’re talking about covering your bills, that’s the starting point. If you have any level of expertise beyond that, it should inform your hourly rate. People shouldn’t feel bad if their expertise means their hourly rate is a decent amount beyond barely getting by. 17:11 Justin: On the opposite end of that, you also shouldn’t be gouging either. You can’t arbitrarily raise your internal hourly rate to astronomical numbers—it doesn’t work that way. You have to apply common sense to this number. It can’t be astronomically high and it shouldn’t be way too low. You should look at it and when you get it in the right range, your gut should tell you it’s right. 17:49 Sean: How many hours are going to go into this project? That’s an estimated amount of time because you can’t know it exactly. You’re not saying to the client, “Here’s the rate and you’re paying me as long as it takes.” Part of the appeal of Value-Based Pricing is we’re giving the client a fixed price. They’re not going into the project blind, they’re going in on a price you gave them and you will stick to, whether it takes longer or shorter than you imagine. That’s where this estimate of hours comes in. 18:30 Justin: It’s important to understand at what point in the Value-Based Pricing process we are now. When you’re starting to calculate these numbers, the discovery and information-gathering should be, at least, mostly done. At this point, you should have an incredible amount of information about the project and the client. You should have a good grasp on how long the project might take you. One thing I’m bad at is estimates when it comes to hours and things like that. We’ll be talking more about how to factor in your confidence level about your estimates but right now we’re talking about how long it will actually take you to complete a project in hours. 19:20 Sean: In the chat room, Lauri says, “Hourly rates punish productivity and effectiveness—both internal and external rates—therefore the concept of hourly rates should be discarded all together.” Pricing based on hourly rates alone or in isolation does punish productivity and effectiveness but we’re not talking about pricing the project on hourly rates alone. Time is a reality and it is a factor within the way you price. The problem with pricing on hourly rates is: it’s the only factor. This doesn’t mean time isn’t a factor because it is in many ways—from your time to the time expected to realize a return on investment. Time affects the price in a lot of ways but not in isolation. It’s not the only factor affecting price. Just because hourly rates punish productivity and effectiveness doesn’t mean you shouldn’t account for time within your pricing. Using an internal hourly rate is not the same as when you use hourly pricing in isolation. 21:08 Justin: The internal hourly rate isn’t designed to drive the price you give the client. Within the context of Value-Based Pricing, it’s designed to ensure the project is worth your time and you’re not going to lose money on it. 21:49 Sean: One of the reasons you need this baseline rate, even if it’s an internal number, is because value is a completely separate factor. You don’t determine the value to the client, they determine it. In a lot of cases, the value to the client is low enough to where the project isn’t viable. The problem is if you don’t have an internal rate to go off of, you can’t effectively determine if the value to the client is so low that it causes the project to go into the red. Will it begin to cost you in terms of time and expenses? 22:43 Justin: Let’s say you’re in a scenario where a client comes to you, Sean, to create a wedding invitation and it’s going to take you 8 hours to accomplish what they want. For this example, your internal hourly rate is $100/hour. That’s $800 you would need in order to cover doing the project but if you discover the value to the client is lower than that—if they only have a value of $400 for the project—that means you don’t do the project because the numbers don’t make sense. The internal hourly rate doesn’t drive the price you give to the client. You don’t go to the client and say, “The price is $800,” even though you know it’s only going to bring them what they perceive to be $400 worth of value. The project isn’t viable and you should tell them it’s not going to work out. 25:14 Sean: Obviously you have to keep the lights on, but Justin, can you give us some examples of project costs? 25:35 Justin: The cost of your time is determined by your internal hourly rate but each project can also have costs beyond that. Some projects require special materials, software, equipment, renting space, or travel. There are a lot of costs involved in projects that vary depending on industry and the situation. Another great example is digital resources like fonts and stock photography. Those are your costs and, again, this is another estimate but it’s much easier to estimate. You have a firmer grasp on tangible things vs. your time. This should be a fairly easy number, in most cases, to come up with. 27:02 Sean: What kind of things will we need to buy? Are we going to need to buy a server, plug-ins, or software? If you’re a designer and you’re handling the printing of letterpress cards, those are all costs that factors in. 27:31 Justin: In the chat room, Sarah has a great question, “If you have to keep your internal hourly rate to yourself, how do you detail the total price on your quote? Do you just put the total?” The answer to that is yes. None of these individual factors we’re talking about are anything the client sees. They don’t see your internal hourly rate or the estimate of your costs. All they see is the price. 27:57 Sean: None of this is itemized for the client, this is only you coming up with a price for the client. You don’t say to the client, “Here is my value-based price,” or, “Here is my One-Concept Approach logo.” When you’re writing a blog post, you don’t type out, “I’m going to provide you with a lot of value here,” you simply give something that’s valuable. This is how we refer to things, it’s not something you refer to with the client. 28:33 Sean: Your estimate buffer is essentially your confidence level. This is a factor built in to adjust the entire quote based on confidence level. 28:58 Justin: We’re talking about estimates of how many hours to take and cost of materials. You can’t use them in isolation and hope everything works out. When you’re coming up with your value-based price, you have to think about how confident you are in these estimates. 29:21 Sean: The confidence is as it applies to the estimates, not how confident are you in your skills. We’re talking about confidence in the context of how sure you are that you’re nailing those numbers. 29:40 Justin: If you’re not sure, then you might want to have more conversations with the client if you think that will help you clarify things. Sometimes, due to the nature of the project, you don’t have a lot of confidence in the estimates you come up with. Another way to think about this is through your own internal risk. If you estimate 10 hours to do a project and it ends up taking 20, that’s a big discrepancy. If it does actually end up taking 20 hours of your time, it might not be financially viable at that point. This estimate buffer is designed to compensate for that. If you’re unsure of the estimates you’ve come up with in terms of time and costs, then your estimate buffer is going to compensate for that by increasing the amount you charge to cover if it takes longer. 30:43 Sean: If you’re unsure because you don’t know what you’re doing or you don’t have enough information from the client, that’s a problem. The buffer won’t fudge that for you. You need to talk to the client more, uncover the value, and ask the right questions. Even if you’ve done an exhaustive job talking with the client, there are still unknowables. After you’ve done everything you can, for whatever reason there still might be things you’re unsure about. You can’t know everything and that’s where the estimate buffer comes in. The degree to which you are uncertain about the estimated numbers will vary from project to project and the estimate buffer will help adjust the final price on that. 32:04 Justin: One of the hardest things anyone has to deal with is estimating time. No one is going to be 100% sure it’s going to take exactly [this] many hours to complete a certain project. There are always factors that can’t be foreseen in the beginning, which this buffer is designed to compensate for. You’ll do a project that might come in under the estimated number of hours, then your estimate buffer is just padding there. It helps compensate for the next project that might go over your hours. 33:07 Sean: What do we expect the client to realize in terms of value? There’s a number of ways you can create value for your client—most often it’s through increased revenue. That’s the most common way but it’s not the only way to create value for the client. It could be more intangible like increasing brand perception, decreasing expenses, or reducing risk of danger. How do you figure out what that value is? 34:43 These are your own investigations into the climate surrounding the project, the client, and the industry. Get a general feel for their industry and find out what’s valuable to someone in their position and industry. What does a successful version of this project look like? What are the best potential upsides of this going well? If you could wave a magic wand to make one problem go away, what would that one thing be? What is keeping you from working on the important things you need to work on in your business? 36:17 Justin: One of my favorite questions to ask is, “What do you expect to happen if this project succeeds?” The main reason I ask that is because it gives me information that helps me do better work. All of your questions to the client should be framed around: the more information you have on their needs, wants, and struggles is going to help you solve their problems that much better. This question is a great one for that because it gives you a lot of insight into what they’re hoping will happen and that’s directly tired to the value they hope to realize. They’re not going to hope something is going to happen just for the sake of it. They’re going to hope something happens because they’ll derive value from it. 37:17 Knowing what they’re hoping for helps you determine what that value is. It’s very much an investigative process—there’s not a single set of questions that will help you know the value. It should tailored to every situation with every client. If you ask the client, “What do you expect to happen if this project succeeds?” and they respond with, “Well, through this branding redesign, we were hoping that we’d attract a younger crowd.” That leads you to a series of other questions: why do they want to attract a younger crowd? Do they see revenue opportunity there, because they think the younger crowd is likely to spend money on their product? It opens a door into the depths of where the client’s mindset is. You discover value through questions like that. 39:29 If we hadn’t built the new chat system, we would have run the Community into the ground because the old one couldn’t have supported everyone in there. People would have left. It’s not just about making more money or attracting more customers as a result of this project, but maybe it should be positioned as, “What do you have to lose here? What are you risking by not doing this project?” Money that’s not lost is effectively money that’s made. If a client is about to lose money as a result of not solving their problem, solving the problem is making them money. That’s not obvious if you’re only thinking in terms of how much revenue can be added to their bottom line. 40:16 Justin: Another great question to ask the client along that same vein is, “What if we do this project and it fails? What are the ramifications to you there?” Knowing what they expect to happen during a successful project is valuable but also knowing what they expect if a project fails is equally as valuable. That gives you insight into the worst-case scenarios they’re thinking of to understand where their worries are. You can uncover a lot of value there by diving in to those worries. You might even find more things to help them with that way. If they’re worried about [x], [y], and [z], you might be able to help them with all of those, instead of just the original scope of the project. What if the Client Doesn’t Want to Answer My Questions? 41:26 Sean: People often ask, “What if the client doesn’t want to answer these questions?” They’re worried the clients are dodging questions or making stuff up. I believe a lot of people need to make a mindset shift about Value-Based Pricing. This isn’t about trying to extract money from the client. If you think that’s what Value-Based Pricing is about, it’s only going to breed your worry that the client is “catching on” that you’re trying to make more money from them. It’s not about making more money from your clients—making more money is an upside. The point of Value-Based Pricing is to make the client more successful. 42:39 We’re focusing on what a successful project looks like to the client. We’re not just being technicians, doing tasks. We’re trying to solve problems and create value, that’s why we’re asking these questions. Once you ask, “What does a successful project look like for you?” maybe you uncover it’s not actually about the one thing the client asked you to do. If the reason they’re asking you to do a particular thing is to accomplish a lot more than that obvious thing, then you can tell them you have the ability to help them with all of that. You’re uncovering more and going deeper. You’re trying to help the client have a successful project. As a result, you’ll benefit from the upsides of that. Once you align your thinking with making the client successful—you might make more money as a result but that’s not your goal—the concern that the client might not want to answer your questions becomes less prominent. 44:07 Justin: If you’re asking the right questions and the client is reluctant to answer, that’s a weird situation to be in. These questions should all be focused on helping you deliver an outstanding solution for the client. The questions shouldn’t be framed or interpreted in such a way that looks like you’re just trying to get more money from them. These questions should be about gathering useful information and maximizing the value you can provide. It’s important to frame the questions from that mindset because that’s the key to Value-Based Pricing. You can’t come across as asking leading questions or trying to guide them toward an even larger value. It’s about simply discovering the value they hope to realize. 45:19 Sean: Think of it as a buried treasure—it’s uncovering the value. The questions are brushing away the dirt. You’re uncovering the value that’s there and the client is telling you that value. Your questions are bringing it out but the client is determining it. You’re not influencing the value, you’re uncovering it. 45:47 Justin: It’s likely that, through uncovering one piece of value, you might find more but you should never try to influence their perception of their value. 46:29 If you have a client that’s expected to realize a higher than normal value from your solution to a problem, relative to the market they’re in, the price should go up accordingly. Client’s don’t exist in a vacuum, they exist in industries. They have their own business, in their own field, in their own market. If you can help them realize a higher than normal value from your particular solution, relative to the environment their in, that’s even more valuable to them. That shows you have a unique solution to their problem they can’t get somewhere else. The price should reflect that. In the tool, you answer the question, “What is the value relative to the market?” with “normal,” “higher,” “lower,” “very high,” or, “very low.” The answer you give will tweak the value-based price a little bit to reflect the situation in the market you’re in. 47:45 Sean: The value relative to the market is very different from a rate relative to the market. This is the only time we’re considering the market, except for the duration. We’re not positioning ourselves as a commodity by projecting an hourly rate that can be compared to the market. We’re focusing on value here and that’s the only thing we’re exposing to the market in terms of comparison. The only reason we’re doing that is basically to say the client will get higher than normal value, relative to the market. 48:49 There’s a duration for a project itself—maybe it takes two months or four months—but once the project is completed, how long is it going to take the client to realize the expected value that was baked into the price? If you determined you were going to create a $20,000 value to the client, are they going to see it five years from now? Are they going to see it next week? If they don’t get that value for five years, it’s a very different situation than if they would get it next week. The sooner they are able to get the value—the return on their investment—the more valuable it is. That’s why it’s one of these factors. 50:03 Justin: It’s just like any other market or financial situation: if you put $10,000 into an investment and expect to get $100,000 back, it’s different if you expect that turnaround to come in a month vs. 10 years. Time is definitely a factor here, that’s why it’s part of the input for the tool and it’s something you need to think about when you’re coming up with a value-based price. It ties into the next factor which is duration relative to market. Again, we’re looking at the market here because different markets have different time to realize value. 50:48 Sean: When you say duration, are you talking about duration of the project itself or realizing the value? Is this any different from expected time to realize value? 51:06 Justin: It’s actually a combination of both. From the client’s perspective, it’s going to take you however long it takes to deliver your solution. After that, it’s going to take them more time to realize the value. It’s very rare that you deliver a solution and, immediately, all the value to the client is realized at once. It doesn’t happen that way. You’ll often deliver a solution and it’ll take a number of months or years for the client to realize the value of the solution you’ve provided. If you’re going to deliver a solution that’s going to take longer than normal for the client to realize the value from in their industry, your price should go down because they have to wait longer to realize that value. Likewise, if you’re delivering a solution that allows your client to realize value much quicker than normal in their market, you should charge more. Getting that value quicker is more valuable to the client. 52:16 Sean: Does the duration include the project time and the time beyond completion it will take for the client to realize the value? 52:24 Justin: When you put the duration relative to the market into the tool—like if it’s normal—it ties into the number you put for how long it takes them to realize the value. 52:36 Sean: “Normal,” would require some research depending on the industry and depending on existing solutions within that industry. 52:47 Justin: The seanwes talk chat system is a concrete example of this. The expected time to realize the value for you is very long because you’re all about the long-game mindset and we’re at a relatively early stage with the Community. It’s going to take you a long time to realize the value of the chat system I built. 53:22 Sean: We’re speaking in terms of the dollar amount I’m investing and the dollar amount I’ll get back. There’s plenty of sentimental value, like I love people get to have a great experience in the Community right now, but that experience isn’t generating $50,000 yet. 53:43 Justin: It is going to take a relatively long time to see that monetary value in terms of the general market. It was hard to define what the market is—is it people who have their own Community and are looking for chat solutions? That’s narrow. You have to go broader sometimes. In terms of the market of the internet, things move pretty quickly but you, Sean, are about the long-game. When I went to calculate how long it would be for you to realize the value, it was in years, while the duration relative to the market was high It would take a long time to realize your investment so that drove the price down. Whereas, if you were going to realize a ton of value very quickly relative to the market you’re in, the price would have gone up because I’m providing additional value through delivering the value quicker. 54:57 Sean: In the chat room, Lauri is asking about our definition of value. He was bringing up that the seanwes talk chat system is worth money to me right now. I said it prevents shorter-term loss, which is one of the aforementioned factors, but my thought is he’s asking as the client. The client is the one that determines value for themselves, you’re just uncovering it. How do we define value in an objective sense? 55:49 Justin: Like you said, there is sentimental value with the seanwes talk chat system because you want to give the best experience possible to the Community members but in any other case, your client is running a business. At the end of the day, the business’ goal is to bring in revenue. If you dig deep enough, everything will eventually get to that goal. 56:36 Sean: Earlier we talked about ways you can add value to clients—increased revenue, lowered costs, reduced risk, boosted brand perception, etc. 56:48 Justin: If you dig even deeper than that: what is the value of boosted brand perception? Why is that valuable to a client? More brand perception means more people are aware of them. Why is that good? If more people are aware of them, that’s more potential customers. Why is that good? More potential customers means more people are buying their product. It’s long-game increased revenue because it’s not immediate. There’s a duration that’s inherent to that particular arc. You don’t get increased brand perception over night, it happens over time. 57:32 Sean: Would you say there’s other kinds of value other than tangible or intangible value? To me, it all boils down to those two. If you decrease costs or reduce risk, ultimately, that means more revenue. If you add money, that’s more revenue. There’s tangible value and intangible, or sentimental, value—like in the wedding invitation example. Do you think it goes anywhere beyond those two? 58:42 Justin: I don’t think it goes beyond tangible or intangible value if you dig deep enough. It definitely boils down to those two because they’re the ultimate driving factors for any client you’ll have. 58:50 Sean: Let’s say a project doesn’t go well, is that something you, as the professional, take on in terms of risk? Or is that something the client takes on? 59:31 Justin: It’s more complicated than that. There’s different kinds of risks through the life cycle of a project. In the beginning, when you’re talking with a potential client about a potential project, you have to ask yourself, “How risky is this project for me? How likely is it I’m going to be able to deliver a solution that will work out?” I mean, how likely is it you might get hit by a bus and leave them hanging? Every project has the inherent risk of you actually being able to deliver the solution you’re promising. That’s what the risk is when you’re trying to determine the value-based price. 1:00:24 Say you’re a logo designer and you’ve designed 200 logos previous to the client you’re talking with now. You’ve got a good sense of what they want and you feel you can deliver a good logo because you’ve done it 200 times. The risk is very low in that situation. You’re almost guaranteed to deliver that logo to them. Whereas, with a more complex system like seanwes talk, there are a lot of unknown variables because there’s so many people involved. The risk it might not work out or it takes a lot longer than the client expects increases the risk of the project. 1:01:23 Sean: Let’s say the risk is deemed as higher than normal, can you speak to how that affects the price? 1:01:34 Justin: If the risk to the client is going to be higher—they might not get a solution or it might take much longer than expected—that drives the price down. You don’t want to charge more money and then leave them hanging. If the risk is low, that will drive the price up. 01:1:57 Sean: It’s a guaranteed solution, effectively. 1:01:59 Justin: The less uncertainty the client has, the more valuable the solution is to them. Clients hate uncertainty. 1:02:13 Sean: In the last episode I mentioned that if I had paid you at an hourly rate and the total was, say, $38,000, it’s more worth it for me to give you $50,000 at a flat rate and know that will be it. 1:02:27 Justin: This is a hard concept to get your mind around. It took me a long time to realize this was the mindset of clients the majority of the time. They love certainty. They love knowing a project will take [x] dollars and that’s it. There’s no hourly ranges or ambiguity—it’s clear and concise. Likewise with the risk, if you can determine your risk of delivering is low, you can charge them more because they like that certainty. You’re delivering value to them by having that risk be low. 1:08:12 Justin: That will be one of the great things about the tool. If you’re trying to fill in the questions the tool asks and you find yourself struggling to put in a value, that’s a good sign you need to talk to the client more or do more research about their industry. Even if you don’t have the tool, take notes on the factors we’ve discussed in this episode. Use those factors internally. Those are all the things you should be considering when you’re coming up with a value-based price. If you don’t have a grasp of any of those factors, you need to do more investigating and question asking. You need to find that information before you come up with the price. 1:09:14 Sean: In the chat room, Ben Flack says, “Sean, you’ve talked about how you raised your prices over time and ended up charging $8,000 for a logo. In retrospect, it sounds like it wasn’t a value based price but a flat rate, is that right?” I did say I’ve charged a client $8,000 for a logo and he’s correct about it being a flat rate. It was an arbitrarily inflated rate that was a faux value-based price. That’s what people are trying to do when they have hourly rates and they’re trying to adjust the rate on the fly depending on the client. If it’s a big client they think they should charge more and they’re just making it up. They’re coming with a faux value-based price that’s their hourly rate inflated but it doesn’t take into account all the factors we’ve discussed. 1:10:10 I didn’t understand Value-Based Pricing back then. I raised my rates but who’s to say that $8,000 shouldn’t have been $20,000? I ended up talking to someone who knew someone else who worked at the company I did that logo for and the company thought it was a steal. They thought it was a no-brainer but the client isn’t going to tell you that. You won’t even realize it because you weren’t uncovering the value to the client. That’s the power of Value-Based Pricing. It’s not about gouging our price, it’s about acknowledging the value we’re creating for the client. If we’re creating a lot of value and it’s something the client determines, then it’s absolutely appropriate for you to get some of the upside. If you’re happy with an $8,000 project, that’s fine. But what if it could have been a $20,000 project? 1:02:11 Justin: At first glance, Value-Based Pricing does look like you’re just charging more because you’re delivering a lot of value but, as you can see from the last two episodes, there’s a lot more to it than that. One of the reasons I devoted so much time and energy to developing a Value-Based Pricing tool is because arbitrarily increasing my hourly rate or artificially inflating project costs didn’t feel right to me. It didn’t sit well with me because it’s arbitrary and I don’t like doing things for arbitrary reasons. I like to do things because it helps—either me or the client. In this case, it helps both. 1:12:18 Sean: The client loves that kind of certainty too. They don’t like arbitrary things. They don’t like when you come to them and say suddenly, “My hourly rate is more and the expenses are more.” Well, why? That feels arbitrary to them. You should be saying, “Here’s what we’re solving. This is what the upsides look like. You’re going to get $100,000, I’m charging you $20,000 or $30,000.” That’s a no-brainer to them, they don’t have to deal with arbitrary inflation. 1:12:55 Justin: One of my original motivators for charging more is if I’m charging more, I can focus more and I can do better work. It wasn’t until I dove into the details of Value-Based Pricing that I realized it’s a system that supports you in doing the best work you’ve ever done. 1:13:24 Sean: For the people saying, “No one would ever pay me that much. No one values design that much,” you just heard me talk about how I charged $8,000 for a logo. That sounds insane for a lot of people. If I even said people are charging $500, some of them are going to be saying, “I wish!” It’s not only that I charged $8,000 for that logo, it’s that the client thought it was a steal and they would’ve paid more had I been smart enough and known the things I’m teaching you now. You don’t need a ton of clients that focus on value instead of wanting you to perform a task. There’s plenty of clients out there who want the job done through performing tasks and who will compare you to the cheapest rate but you only need 1 value-focused client to 50 task-driven clients. I’m not exaggerating here. Imagine if I had done Value-Based Pricing with the $8,000 logo client. The power of Value-Based Pricing is you don’t need a ton of clients. Stop worrying the wrong type of clients won’t pay you higher rates—they won’t! 1:15:39 Justin: Ryan Flannigan asked this epic question, “How do you factor in and charge for assumed gains? Do you take the client’s word that the project will increase their audience to a certain size, which will in turn help them realize a certain number of sales because they’re the professional in their domain?” You should watch for red flags in what their saying and trust your gut, but yes. Realize the client is the expert in their industry, just like you’re the expert in yours. For the most part, you should trust what they say unless you have a gut feeling or data that informs you otherwise. He goes on to ask, “What happens if the client’s theorized numbers were incorrect and the project doesn’t make the assumed value, for both if they made less than expected or more?” We’ve already talked about risk being built into the value-based price but I want to clarify the fact that the client is ultimately paying you to implement a specific solution. They’re not paying you to guarantee success. They’re not paying you to guarantee a return on investment. 1:17:05 Sean: We’re not in the insurance business. 1:17:07 Justin: Exactly. You’re in the business of creating things and delivering solutions, it’s not about guaranteeing a specific return to your client. The value the client realizes typically happens long after your engagement with them has come to an end. You build in the risk you can assume in the beginning but after they’ve paid you and you’ve delivered on the solution, the actual outcome should have no bearing on the price you charge at the time. You factor in the risk as best you can but if it turns out to fail for them, they’re not going to come back to you. 1:18:02 The next part of Ryan’s question is, “Would the latter be a clause placed in the professional’s contract to protect from legal action? In regards to Relationship Marketing, would such information be discussed, brought about even, outside of the legal documents in order to bring attention to the possibility while calculations are being made?” First of all, we’re not lawyers and this is not legal advice. Estimated value and risk are part of a value-based price, a guarantee of success is not. A lot of people are worried about this because we’re talking about large amounts of money here. There’s a fear that the client is paying you a lot of money and what if the thing you deliver to them doesn’t end up working out in the long-term? That’s a risk and it can happen. Doing really good work and meeting all the conditions of your agreement with them is your responsibility. It’s not your responsibility to guarantee their business and the way they use your solution is going to succeed. 1:19:28 The final part to his epic question is, “How would the professional avoid the former scenario of more value obtained from the work at less the cost of the value charged, since the numbers didn’t match the reality of the situation?” You can’t avoid this and even if you could, I wouldn’t recommend it. You should under-promise and over-deliver. Wow the client and make them as pleased as possible. If they end up realizing more and more value than they thought they would, that’s great! Now your client is super happy with you because they’re getting even more value than they assumed and they’re going to tell other people. Client’s talk with other people who are potential clients. Value-Based Pricing isn’t about maximizing the money you make. Value-Based Pricing isn’t about maximizing the money you make. Value-Based Pricing is about maximizing the amount of value you can deliver to the client and maximizing the quality of your work. 1:21:30 Sean: Samuel asks, “When a client keeps asking me to do projects, do I propose a monthly pay to be on hold or keep doing Value-Based Pricing for each project? It’s for a coffee shop I’m doing packaging and branding for, making signs, etc.” They keep asking him to do projects and he’s wondering if he should have some sort of monthly retainer, or do Value-Based Pricing for each project. 1:22:06 Justin: I would lean towards doing Value-Based Pricing for each project unless there’s mitigating circumstances. The fact that you have a client asking to you do a lot of projects doesn’t mitigate that each project they ask you to do has value in it. You’re in an even better position to do Value-Based Pricing with this client because it’s a client you know. You know their situation and you know where they’ll derive value so you’re able to more accurately give them a value-based price every time. 1:22:51 Sean: You would only want a monthly retainer if you were in a situation where you were guaranteed a paycheck, almost like a full-time employee, where you want that security. If you’re independent, I don’t see a reason not to do Value-Based Pricing for everything. 1:23:13 Justin: It’s difficult and it definitely takes more work but I think it’s worth it. 1:23:23 Sean: It’s obviously going to be more difficult—we’ve done 3 shows on it! Maybe that informs whether or not you take on the minutia. If they’re coming to you with petty little things and the effort to just figure out Value-Based Pricing for each of them is more than what the work is worth, then maybe you shouldn’t do it. Maybe it’s a matter of needing to focus on better projects or using the Overlap Technic to get your bills paid another way and taking the right type of clients with Value-Based Pricing until you can afford not to take on the smaller jobs. 1:24:09 Justin: After rereading his question, doing the packaging, signage, and branding for this coffee shop sounds like one big project to me. That could be combined into a single large branding/packaging project and do Value-Based Pricing for the project as a whole. You might do the work over time, broken up into smaller projects logistically, but why not combine it all into a single value-based price? 1:24:47 Sean: Now that you bring that up—it might be a matter of the client saying, “Hey, do this little thing,” a bunch of times and you always responding with, “Yes sir, client. I’ll do this little thing.” It’s a matter of you needing to ask some questions instead of just doing the task! Value-Based Pricing is about uncovering the problems you’re trying to solve. What are we doing with this packaging? Maybe there’s something more behind this. It’s not just about this one product’s packaging, it’s about this overall experience or rebranding their identity across all mediums. Maybe there’s a bigger project here that you’re not realizing because you’re too busy performing the tasks as told. 1:26:10 Justin: Your raw cost is based on your estimated internal hourly rate, plus the estimated cost of materials and resources it will take to do the project, multiplied by the number of hours you think it will take to do. That’s an internal calculation, then you go on to discover what the value to the client is and you take that and compare the two. If your costs to do the project is higher than the value they’re going to realize, it’s not a viable project. Either things need to change or you don’t do it. Hopefully that explains the separation there. 1:27:19 Sean: I just wanted to clarify that you’re not itemizing two separate things to the client. The costs mentioned are internal factors. Ben actually clarified in the chat room just now. He asks, “Does the final number include the cost or is it in addition to the cost?” The price you give to the client is all-inclusive. Cost is one factor that goes into the all-inclusive price you give to the client. 1:28:07 Justin: Let’s say you estimate a project will cost you $10,000 to do—including your time, the resources you’ll need to complete it, etc. That’s your raw, internal cost. The client doesn’t see that. Then you look at the value the client will realize and if that’s $50,000, then that’s a viable project. It’s going to cost you $10,000 and the client will realize $50,000 so you’ve got a buffer. One of the things the tool does is it starts with 50% of the value the client is expected to realize and it goes down from there, depending on how much more above your own internal estimated costs to charge them. If the client is expected to realize $50,000 and your raw costs are $10,000, the value-based price that the tool pops out might be $20,000 (I don’t actually know without plugging those numbers into the tool). Then you want to tweak that number a little bit and give that final number, and that number only, to the client. 1:29:50 Sean: There’s so many factors. It’s not just adding up costs and the value to the client and taking a percentage—it’s not that simple. We’re not building a tool for no reason. It’s not an objective value that exists on it’s own, it’s how long it will take to get that value and it’s about how valuable it is relative to the market. There’s so many things that affect the price. 1:30:37 Justin: In the chat room, Ben is saying, “If the project is $20,000 to the client and your time cost is $10,000, do you charge $20,000 or $30,000?” The answer is neither. I think Ben is thinking of it as an additive thing, like he needs to figure out internal cost and then add value on top of that but that’s not it. Instead of thinking of them as two things you add together, think of them as two things that are independent and you compare to each other. If your raw cost is going to be $10,000 and then the value expected by the client is $5,000, compare them. Those numbers don’t make sense because the client will have to pay you more than the value they’re going to get out of it. It doesn’t make business sense to go forward with that project. 1:31:54 Sean: It’s very likely that if the value to the client was $10,000, it doesn’t make sense either. You’re not adding the full value to the client. The client is making an investment here and they deserve to get a return. They’re not trying to break even. 1:32:21 Justin: The return for the client should be substantial. You can’t look at the value they’ll realize, over and above what it’s going to cost for you to do the project, and say, “Oh, look at all that money I’m going to get!” Another example: if the raw costs for you to do the project total $10,000 and the client is going to realize $50,000 of value from it, that doesn’t mean you should charge $49,000 to do the project, leaving the client with only $1,000 of realized value after they’ve paid you. That doesn’t make sense. You want to leave a huge amount of value for the client to realize out of this project. It has to be enticing for them and make sense at a business level for them to do. If it costs you $10,000 to do the work and the client will realize $50,000 of value, charging $20,000 leaves them a huge return on their investment. They’re investing $20,000 into you and getting back $50,000, which means they’re getting back $30,000 worth of value out of that. That’s more than half of what they’re putting into it. 1:33:41 Sean: You likely wouldn’t want to charge more than half of the value the client will likely get. In this example, you’ve got your baseline costs and half of the value to the client would be $25,000. The range between $10,000 and $25,000 is determined by all of these other factors—the estimate buffer, the expected time to realize the value, the value to the market, etc. 1:34:12 Justin: There’s so many factors and it’s difficult to wrap your mind around. This is why I built the tool. The key here is not gouging the client, but working with them to maximize their return on investment. We’re trying to get enough capital out of them to do amazing work without compromising the work we do. If you’re charging by the hour and you have a ton of clients, and you’re scraping by, obviously you can’t focus. You can’t concentrate the way you could if you had the freedom Value-Based Pricing gives you to dig deep into a client’s problem and solve it the best way you can. 1:35:54 Ben asked one followup question, “The raw cost is part of the investment and not in addition to the investment?” Exactly. Your raw cost to do the project is part of the investment the client is making in the solution, it’s not in addition to it. Can You Do Value-Based Pricing As Your First Paid Project? 1:38:06 Justin: This is a chicken and the egg problem. If you’re charging by the hour and scrambling to find whatever work you can to make ends meet, there’s a lot of cognitive overhead there. You have to track your billable time, you have to constantly be on the lookout for more clients, etc. That energy is being taken away from the work you’re doing—the core of what you’re business is. You’re work is not as good as it could be because of that. If those distractions were taken away and you had more energy to pour into your work—that’s what Value-Based Pricing provides you. Once you’re doing Value-Based Pricing you have more freedom to do the best work you’ve ever done. Am I ready to do Value-Based Pricing? Am I doing the best work I can? 1:39:30 If you do Value-Based Pricing, you’ll be freed up to do the best work you can but which comes first? The answer for me is it’s a transition. I’m transitioning, over time, to Value-Based Pricing. Right now I’m at the tail-end of it. The vast majority of what I do is value-based priced but there are still a couple of projects still being charged an hourly rate. Gradually shifting over time was the solution for me. Some people may jump right into it, while other people do hourly pricing for a little while and switch abruptly to Value-Based Pricing. It all depends on the kind of the work you’re doing, the interactions you have with clients, and how good you are at what you do. At the end of the day, people aren’t going to pay a ton of money for the work you do unless the work you do is worth it. You can’t be an amateur and do Value-Based Pricing but you’re probably closer than you think if you’re asking this question. It shows a level of self-awareness and if you’re asking that question, it’s a good sign. 1:41:07 Sean: Value-Based Pricing is akin to professionalism in that I see it as an ongoing journey. It’s something you improve upon and get better at over time. In the chat room, Brookes is saying, “Cognitive overhead is the bane of my existence.” Value-Based Pricing frees you from that cognitive overhead so you can do the best work you’ve ever done. I would answer the question with a question: are you ready to do the best work you’ve ever done? If you are, you want to start doing Value-Based Pricing. Obviously, it won’t be easy. It takes a lot of work, effort, learning, doing things wrong, and figuring it out but fail forward. I would say start with Value-Based Pricing. Your time and costs grow and fluctuate over time. The value clients will receive will increase as you learn to solve problems more effectively and create more value. I think Value-Based Pricing accounts for that flux. Even if you’re not the best of the best, it doesn’t mean you can’t do Value-Based Pricing. Value-Based Pricing is a muscle you need to work to get strong. You should always follow a Value-Based Pricing model. Value-Based Pricing doesn’t mean charging a lot, it means having a process for potentially the most important part of your business. 1:43:12 Justin: My question there is: why would you want to take on projects that wouldn’t be viable? Is it just to build a portfolio or case studies? Even then, I don’t understand why you would take on a project that’s not viable in that way. 1:43:39 Sean: Eric clarified with, “Build relationships with clients who might have bigger problems down the line.” I don’t like the promise of future work. 1:43:49 Justin: The promise of future work is an easy trap to fall into. Honestly, it’s the same odds as playing the lottery. You have these potential clients who you think might have future work for you that’s more lucrative than the work they’re putting out there now—that’s unlikely. If they’re not putting the work out there right now, who’s to say they will in the future? You have no control over their business so it’s a huge gamble there. You should always take projects that are viable. 1:45:19 Justin: That’s not a question you’ll be asked if you have a questionnaire in place that’s filtering out the clients you shouldn’t be working with, if you go through the full Value-Based Pricing method, and if you’re asking the right questions as you go. If you’ve done even a half way decent job arriving at your value-based price and you show it to the client, all they’ll see is the number you’re giving them to solve their problem. They’ll see they’re going to receive so much value from it that they’re only going to worry about how quickly they can get you the money. They won’t be concerned with where the money is going on your end. They have problems they’re focused on valuable solutions to and if your price isn’t wildly off, they’ll jump at it. 1:46:30 Sean: The client doesn’t care about your costs. They don’t care how your pricing breaks down. When you focus the client on a budget at the very beginning, that’s when they care. Everyone asks, “What’s your budget?” It shouldn’t be about budgets. If you start the project off focused on money, that’s where it goes. Everyone thinks clients care about your costs, but that’s because they positioned it that way. The clients don’t care about your costs. Clients care about getting their problems solved, and what value they’ll realize as a return on their investment. 1:47:21 If the project’s not going well, it probably started off on the wrong foot—and that likely began with the questions you asked (or didn’t ask) up front. If you’re positioning yourself as being on the same team as the client and asking the right questions, you’ll never get to that point of things going bad. If you’ve asked the right questions and the client tells you they will realize $40,000 as a result of this project out of their own mouth, they have framed the whole project. When you give them a quote of $8,400, they’re not going to be asking you to itemize that.